Microsoft says "This event occurs rarely, and in some situations may be difficult to reproduce." Since we are Ultimate IT Security experts we were easily able to generate this event. One of these four settings must be configured and enabled in conjunction with the "Allow administrators to override Device Installation Restriction policies" which is found in the same location. 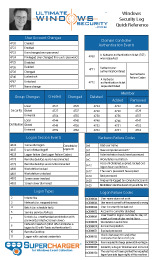 In order to see this event in the Security log, an adminstrator must open Device Manager and attempt to use the "Add hardware wizard" or the "Update Driver wizard" for a device that is specified in one of the previous four settings and also currently attached to the system and listed under "Other devices" in Device Manager. The installation of this device was allowed, after having previously been forbidden by policy.